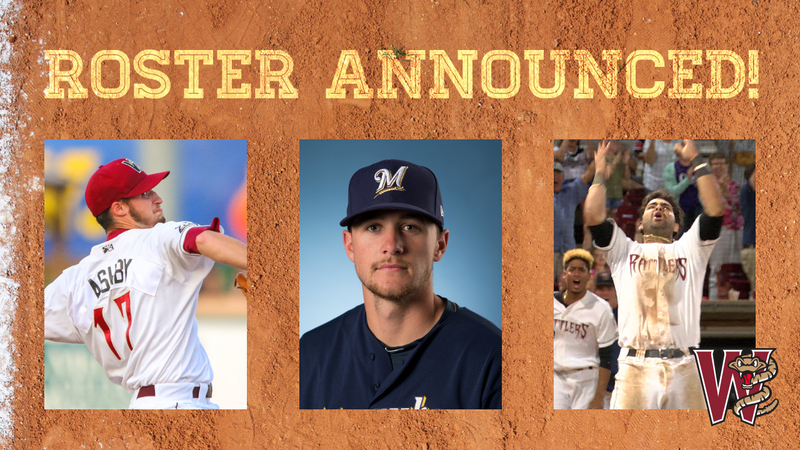 GRAND CHUTE, WI - The Wisconsin Timber Rattlers and Milwaukee Brewers are announcing a tentative roster for the 2019 Midwest League season. The Brewers have placed 26 players on this roster. The team will need to be down to the 25-player limit by Thursday night when the team opens their schedule with a game against the Beloit Snappers. MLB Pipeline has ranked five members of the Timber Rattlers roster on their list of Top 30 Prospects in the Milwaukee organization: Brice Turang (3), Aaron Ashby (9), Pablo Abreu (20), Je'Von Ward (23), and Adam Hill (27). Baseball America rates three of the players on this tentative roster as Top 30 Prospects in the Brewers system: Turang (4), Ashby (16), and Ward (25). Wisconsin has seven members of the 2018 Milwaukee Brewers draft class, including four players from the top ten rounds of the draft: Turang (1st, Santiago High School, Corona, CA), Ashby (4th, Crowder College, Neosho, MO), David Fry (7th, Northwestern State University, Natchitoches, LA), Reese Olson (13th, North Hall High School, Gainesville, GA), Scotty Sunitsch (18th Round, Washington State University, Pullman, WA), Kekai Rios (28th Round, University of Hawaii, Manoa, HI), and Michal Mediavilla (34th, University of Miami, Coral Gables, FL). Opening Week for the 2019 Timber Rattlers begins on Tuesday with FanFest, a free Open House event at Neuroscience Group Field at Fox Cities Stadium, is scheduled from 1:00pm until 5:00pm. The Timber Rattlers players have a workout and a five-inning scrimmage during FanFest. The annual Welcome Home Banquet will be held in the Fox Communities Credit Union Fox Club Wednesday, April 3 beginning at 5:30pm.